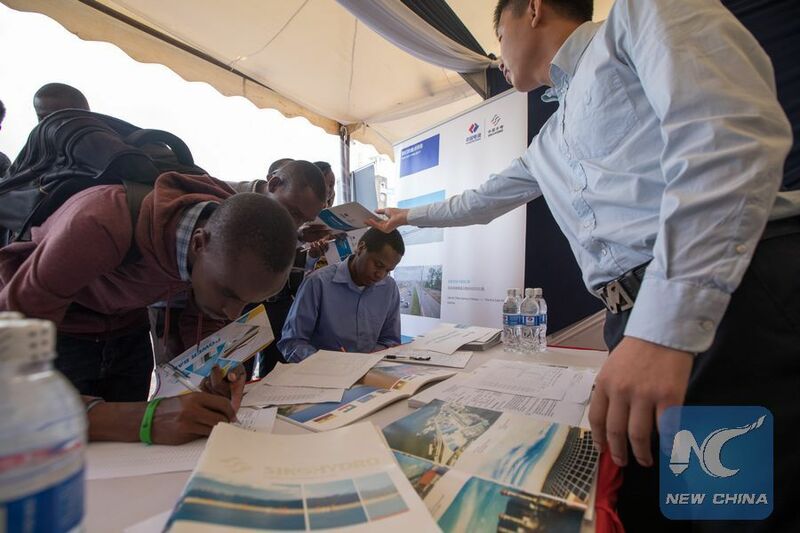 Kenyan youths fill in the application forms in a career fair organized by Chinese firms in Nairobi, capital of Kenya, Oct. 29, 2018. NAIROBI, Oct. 29 (Xinhua) -- Ruth Wambui grew up in a farming village on the outskirts of the Kenyan capital Nairobi where the virtues of hard work, fortitude and service were inculcated in her at a tender age. The 24-year-old commerce and accounting major from a local university has a calm demeanor yet her zeal to join the ranks of youthful peers who have secured well-paying jobs has not diminished in the face of stiff competition. Wambui was among hundreds of young people who attended a joint career fair in Nairobi on Monday organized by a consortium of Chinese companies operating in Kenya with the aim of showcasing opportunities that were up for grabs. She was in high spirits after visiting the stand of Power Construction Corporation of China (POWERCHINA), where friendly attendants explained to her the job opportunities available and how to qualify for them. "This career fair is an exciting opportunity for me because I have managed to talk to representatives of several Chinese companies that are exhibiting who requested my contact details," Wambui told Xinhua. "It was refreshing to hear how these companies are ready to hire skilled local youth," she added, expressing the hope that she will "be one of them in the near future." The Kenya-China Economic and Trade Association (KCETA), with support from the Chinese embassy in Kenya, hosted the one-day career fair to raise awareness on potential job opportunities for local youth. About 50 Chinese firms with around 1,000 job opportunities participated in the career fair that resonated with Kenyan youth aspiring to secure well-paying jobs and upgrade their technical and managerial skills. Wambui and her peers who learnt about the career fair from announcements in the media and social media platforms expressed optimism that working for a Chinese firm would be a game changer in their personal and professional lives. "At least, I am lucky to have an experience with a Chinese company during my internship at China Wuyi. My desire is to become an accomplished auditor and hopefully render my service to any of the Chinese company based in Kenya," Wambui told Xinhua. The inaugural career fair organized by Chinese companies based in Kenya was a draw to local youth whose zeal to work for them, earn decent income and refine their skills was palpable. Walter Kirivwa, a 22-year-old education major from a Kenyan university, hailed the career fair, terming it an eyeopener to skilled youth yearning for a chance to work for Chinese companies that are behind economic transformation in the country. "This event came at an opportune time and has exposed us to the enormous opportunities that Chinese firms have for trained youth. We must appreciate that Chinese companies are strong in infrastructure, real estate and technology that is changing our lives," Kirivwa said. He dropped his contacts at several Chinese companies' booths in the hope that a positive feedback would be forthcoming. An estimated 400 Chinese firms that are operating in Kenya have created many new jobs for local youths while providing a platform for this demographic to hone skills in various disciplines like engineering and finance. Kate Ouma, a 23-year-old finance major, said Chinese firms, whose investments portfolio in Kenya is expanding, have become prized employers of choice among local youth. "It is a fact that our country is benefiting from massive investments from Chinese companies and the youth are keen to work for them given that decent incomes and career mobility is guaranteed," Ouma said. She engaged in a chat with attendants at China Wuyi booth and later dropped her mailing address for future correspondence. Elvis Muli, a 24-year-old major in procurement and logistics, who travelled from the port city of Mombasa to visit the career fair in Nairobi, said that he aspired to work for any of the Chinese firms operating in Kenya to earn a living and gain from exposure. "I am informed that Chinese companies are strong on logistics that happens to be my field of expertise. I travelled all the way from Mombasa to learn how these firms recruit their staff and network with a potential employer," said Muli. Kenyan officials who attended the inaugural career fair, organized by the umbrella body representing Chinese companies in the country, said it marked a milestone in economic and trade cooperation between two long-standing partners. "This career fair is one of a kind and a confirmation that our relationship with China is having a positive impact," said Christopher Chika, director of Asia and Australasia Directorate at Kenya's Ministry of Foreign Affairs. He said Kenya is keen to tap into skills and technology provided by Chinese firms to boost diversification of its economy.